Not for the fainthearted. These guys are the most skilled exponents of the Rap/Metal hybrid. WARNING: Contains explicit language, violence, and bulk satire! A Claytons frost last night (a few litle patches) was followed by a glorious day. No excuse for putting off the lawnmowing…geez, what a job it was. No wonder the horses were stuffing themselves. 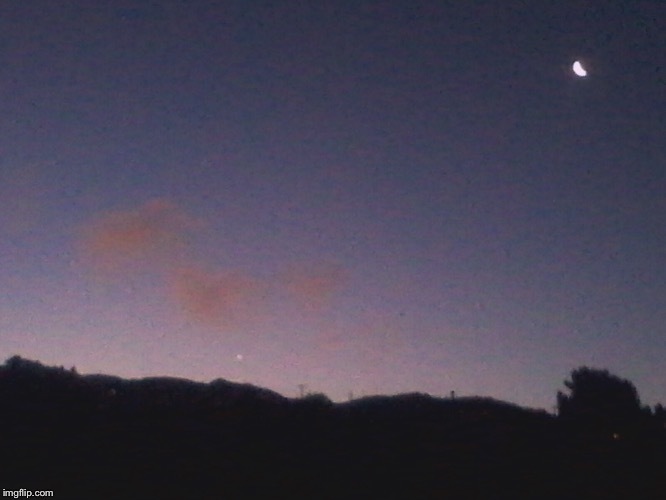 Moon & Venus over Western Hills, North Welly. Actually that might even be Mercury, that low on the horizon. Look to the East, Saturn is rising. Oh yes I know Saturn PG – it’s been stunning and unmissable for weeks now. It’s directly overhead around 11 pmish lately. That photo was taken on 19 May, so It could’ve been Venus, although when I see Venus it’s mostly in the morning. I’d need to check if it was Mercury. When I think about it, it’s unlikely. It’s usually too low on the horizon to be seen from my place because of the hills. It’s so close to the sun I think you can only usually see it for a short period when the sun sets or just rises. From my observations, Venus always has a brilliantly white light, Saturn’s light is always yellow, & when it’s up although Venus is next in brightness to the Moon, you can’t miss Saturn, it’s so big compared to other stars. And Mars will be up there tonite too, I expect. It looks yellow as well, but there’s a reddish tint to the edges. The naked-eye-visible outer planets all follow more or less the path of the sun which is handy if you’re not sure whether it’s a star or planet you’re looking at. Covered just above. Low on the horizon and close to the sun. Full moon tonite. If you go out now and you can see it, you can’t miss Jupiter above and to the left, patu. Always enjoyed this song, but enjoyed it much more after hearing this cover…. “Something kinda sad about, the way that things have come to be.